You have until March 30 to pick up some titles at the World's Biggest Bookstore. Empty display stands looking kind of like the most depressing cakes of all time. Empty shelves/probably also a design for a new U of T building. Stairs that will take you to more rooms that don't have any books in them. Tintin is gone, children. Tintin is gone. A wall that could one day form part of a new Keg Steakhouse. We will never buy another discounted illustrated history of trains from this store again. BOOKS. THERE ARE BOOKS DOWN THERE. 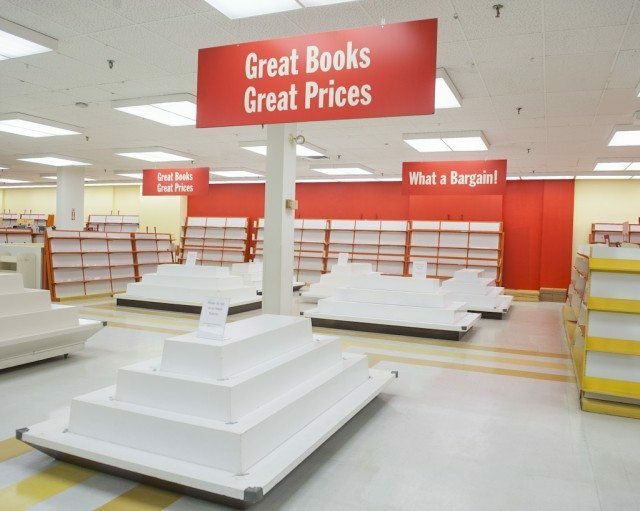 WHAT: The World’s Biggest Bookstore, which has been a Toronto bookselling institution since 1980, and will be closing up shop for good on March 30. Some thought it was an overly loud, barn-like place (kind of like Honest Ed’s, which will also be closing in the near-ish future); others developed a marked fondness for its lack of pretension (much as they developed a marked fondness for Book City’s Annex location, which will also be closing). What we’re getting at, really, is that there are many places we’re fond of that are going away, and while we’re trying to convince ourselves that future generations will form emotional attachments to the restaurants that will likely take this bookstore’s place, we haven’t yet been successful.